Help CentreUsing SuperControl Managing guests, emails and auto correspondenceCan I edit the booking summary autoresponse? 1. Go to Emails/Letters > Booking summary customisation. 2. To include a copy of your logo click “Choose File” and find the logo on your computer to upload. 3. Further down this page there is a Footer section. 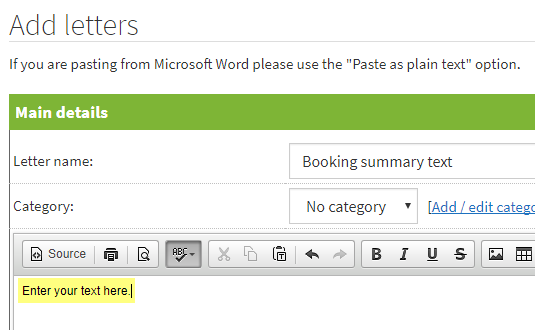 To add additional text to your summary add it here and it will display at the bottom of the booking summary email sent to the guest. How do I change the standard text that displays at the top of each booking summary autoresponse? Thank you for submitting your booking request. We will review your request and will contact you shortly to confirm the booking. Please print this page for your records together with your unique booking request number. Please note that all bookings are provisional until confirmed in writing. 1. To change this to your own custom text go to Emails/Letters > Add. Prev: What is a booking summary autoresponse? Next: How can I schedule emails to be sent automatically e.g. balance reminder?